But there is one enormous difference between Social Security and a Ponzi scheme: Technological change. Over the past century, new technologies have enabled the output of the country to grow much faster than its population. To be more precise, the U.S. population has more than tripled since the early 1900s, while the U.S. economic output has gone up by more than 20 times. This long track record of technology-powered growth has enabled the enormous rise in living standards in the U.S. and other developed countries. In fact, this increase in productivity—output per worker—is the key fact which gives us our way of life today. Assuming that technological progress continues over the next 70 years, and output productivity growth continues over the next 70 years, the finances of Social Security are relatively easy to fix. A fairly minor cut in benefits, combined with a relatively small increase in taxes, will bring the system back into balance again. (the latest Social Security report projects a 75-year deficit of $4.3 trillion. That sounds like a lot of money, but over 75 years it's roughly $60 billion a year…not chicken feed, but not overwhelming). But here's the rub. Ultimately our ability to make good on the "Ponzi-like" nature of Social Security depends on the continued march of technological progress—and in particular, innovation which boosts output and living standards. If we leave the younger generation a good legacy—a sound scientific and technological base, combined with an innovative and flexible economy and an educated workforce—then Social Security is not a Ponzi scheme. The economy grows, and there's more than enough resources for everyone. But if instead we—the current generation—invest in homes, flat-screen televisions and SUVs, then we don't leave the next generation with the technological "seed corn" they need. If the technological progress slows, then Social Security does turn out to be Ponzi-like—with unfortunate consequences for everyone. I'm all for technological progress – though unlike Mandel I personally think flat-screen televisions are a pretty mean technological feat – yet Mandel seems to have a bit of a technology fetish, such that it's the cure for everything. In this case, technological progress – which affects Social Security by increasing productivity, thereby increasing wages – doesn't have that much to offer. The reason is that retirement benefits in the future are based on wages today; if technology raises worker's wages today, it also increases the amount Social Security promises to pay them in the future. On a person-for-person basis, it's roughly a wash.
Technology/productivity/wage growth can help because benefits paid to current retirees aren't indexed to wage; they rise year-to-year only with inflation. So if wages rise, the cost of paying current benefits falls relative to the wage base. Roughly speaking, the system's actuarial deficit – currently around 1.7% of payroll over 75-years – improves on a one-for-one basis with rising wage growth. The baseline rate of wage growth is 1.1%, so this implies that if wages grew at 2.8% then the program would be solvent for 75-years (though not beyond). The spreadsheet I posted here lets you play around with different economic/demographic assumptions. The key takeaway for me is that we shouldn't bank too much on productivity growth to bail us out of the Social Security problem. Is the Social Security tax regressive once you account for benefits? It's sometimes argued that, while income taxes are progressive, the progressivity of the total tax code has to be viewed inclusive of payroll taxes, which are either flat (in the case of the 2.9% Medicare tax) or regressive (in the case of the 12.4% Social Security tax, which applies only to the first $106,000 in earnings). It's not always clear from these statements what the net effect is. A new CBO letter allows for a better view of this, although even this doesn't tell the whole story (as I'll discuss below). 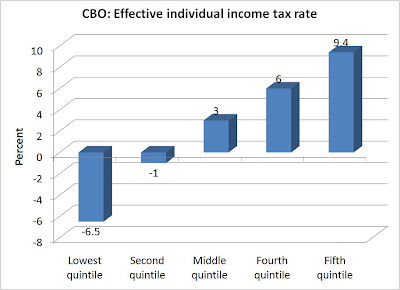 The picture below first shows effective income tax rates by income quintile, for people in 2005. As you'd expect, they're pretty progressive, and the poorest 40 percent of Americans pay negative rates through policies like the Earned Income Tax Credit. 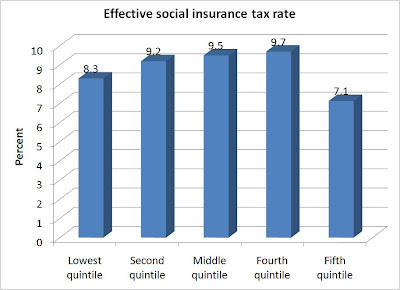 The next picture shows effective social insurance – Social Security and Medicare – tax rates, also by income quintile. While rates are somewhat progressive through the fourth quintile, they decline for the top quintile because of the cap on Social Security taxes. If we add social insurance and income taxes, along with corporate income and excise taxes, the next picture shows total effective federal tax rates. As you can see, even if we add social insurance taxes, the overall tax code is still reasonably progressive (in my view; others may defined reasonable differently). But below is a chart I've constructed from a different data source, the GEMINI model of Social Security financing. The key issue with Social Security taxes is that while the tax itself is regressive, the benefits are progressive. Since taxes pay for benefits, you want to look at the progressivity of the Social Security program as a whole. The chart below is for individuals retiring in the 2030s, although they would not be much different for people retiring earlier or later (it's just the data I had lying around…). I've calculated effective payroll tax rates by lifetime earnings quintile, which means the payroll tax paid minus the disability and retirement benefits the individual receives. If you received benefits exactly equal to your taxes (plus interest at the government bond rate) then your net tax would be zero. Although net tax rates are always lower than the statutory 12.4% rate, at least for people (as here) who survive to retirement, the distributional picture is very different. The highest quintile of lifetime earners pays a net tax of around 3 of earnings. This implies that they pay 12.4% of wages while working, but then receive benefits back equal to around 9.4% of wages. While this isn't a great deal – in a fully funded system they'd receive back everything they paid in – it's better than paying 12.4% and getting nothing back. But notice what happens as lifetime earnings decline. Net tax rates are negative, meaning that (under current law benefits, at least) most folks would get out more in benefits than they pay in taxes. For the lowest earners, net taxes are very negative, around -27 percent. This means that on average these folks receive about three times more in benefits than they pay in taxes. Remember this the next time someone says that the Social Security tax is regressive: sure, it is, but things look very different when benefits are counted into the picture. 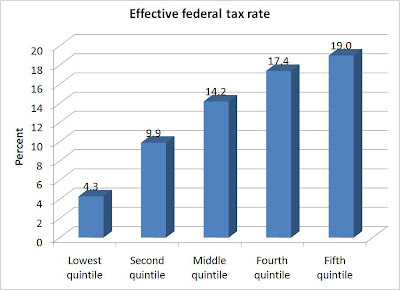 As a P.S., why are net tax rates more negative for the middle quintile than for the second quintile? The answer to that is, I don't know – although because this data output mixes both retirement and disability benefits, it should be possible to disaggregate them and get a better feel for things. Social Security rules changes increased full-time work by married men aged 65 to 67 by about 9 percent between 1992 and 2004, encouraged later retirement, promoted the return to full-time work after retiring, and facilitated working part-time after retirement. In How Changes in Social Security Affect Recent Retirement Trends (NBER Working Paper No. 14105), co-authors Alan Gustman and Thomas Steinmeier find that changes in Social Security rules have changed the shape of retirement. Rule changes increased full-time work by married men aged 65 to 67 by about 9 percent between 1992 and 2004, encouraged later retirement, promoted the return to full-time work after retiring, and facilitated working part-time after retirement. All in all, they account for about one sixth of the increase in labor force participation by 65 to 67 year old married men between 1998 and 2004. One of the main reasons for enacting the 1983 Social Security reforms in the United States was to increase the labor force participation rate of older workers. In 2000, Congress further expanded work incentives by abolishing the Social Security earnings test for people over the normal retirement age. As a consequence, in 2004 more men over age 65 were working than in earlier years. Overall, between 1998 and 2004 there was a 3.1 percentage point decline in the fraction of 65-to-67-year-old men who were completely retired. But the experience of younger men was different. Labor force participation rates declined for men aged 50 to 56. And, more men were retired at younger ages in 2004 than in previous years. In 1998, 80.4 percent of men 50 to 56 years old worked full-time. By 2004, only 75.5 percent did so. To isolate the effect of Social Security rule changes from other factors -- such as the abolition of mandatory retirement ages, changes in employment and compensation policies, rising incomes encouraging early retirement, the stock market boom, and the rising labor force participation rates of women -- the authors estimate a retirement model using Health and Retirement Survey data on 2,231 married men. They then simulate the effects of evolving Social Security rules, assuming that each individual has the work history actually experienced. Individual time preference rates are varied, so that some people respond strongly to delayed incentives and others respond only to incentives that affect current consumption. The baseline model's estimates suggest that the value of retirement leisure is increasing by 5.4 percent per year, a relatively low value, suggesting that economic incentives can change work effort in retirement. Poor health increases the value of retirement leisure by approximately the same amount as being seven years older, and individuals may change their perception of retirement after they experience it, with some deciding to go back to work. The simulation results further suggest that differences in Social Security rules have no effect prior to age 62. This means that the decline in labor force participation observed for those in their fifties has another cause. In 1981, Chile was the first country to replace its public pay-as-you-go pension system with mandatory individual retirement accounts. This system has become a model for pension reformers around the world. Although Chile's system has undergone many changes since its inception, a number of policy challenges remained, including worker coverage, pension adequacy, gender equity, and administrative fees. A March 2008 comprehensive pension reform law addressed many of these issues by adding a basic universal pension, requiring the self-employed to join the individual account system, encouraging greater competition among pension fund providers, lowering administrative fees, providing financial incentives for women to work longer, allowing widowers to receive a survivor pension, dividing individual account assets between spouses in case of divorce or marriage annulment, expanding voluntary pensions, setting up a new administrative structure, and launching a new financial education program. I occasionally go off the Social Security/pensions/aging theme and do some digging on other issues that interest me. Like many Americans, I've been hearing about what the bailouts of the auto industry may require of union wages, benefits and work rules, as well as reading a bit on whether Congress should pass so-called "card check" legislation that would make it easier for workers to unionize. The basic logic I see for a union is that it improves the bargaining power of labor versus capital (meaning, the stock and bond holders who own a company). Capital can easily shift from state to state or overseas while labor moves only slowly, so you could argue that by banding together workers have more leverage and can extract more from their employers in terms of wages or benefits. So here's a quick test I thought of: compare the rate of unionization within a country with the share of that country's GDP that flows to labor rather than capital. 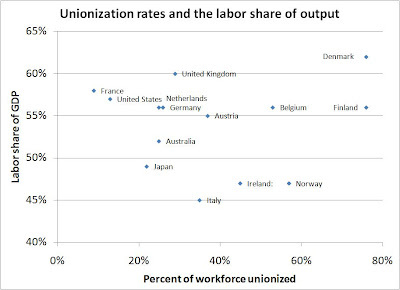 Presumably, if unions are effective at increasing the bargaining power of labor versus company ownership – distinct from, say, benefiting union workers versus non-union workers – then the labor share of GDP should be higher in countries where a larger share of workers are unionized. The variation in union membership is a lot larger than the variation in the labor share of GDP, but there's no strong statistical relationship between one and the other. Countries with a larger unionized labor force don't receive a larger share of economic output. The split between workers and owners seems pretty much independent of whether the workers are union-represented or not. This seems strange given that we know that, in the U.S. at least, unionized jobs pay more than non-unionized ones, even within the same industry. The question is, who is "paying" for these higher wages? It might be other workers, such that unionization might result in a smaller number of higher-paid jobs, although a quick cut through the data doesn't show anything obvious there. In any case, though, I thought the lack of any correlation between unionization and the share of GDP that flows to workers rather than owners is interesting, given how big a policy issue unions have become in recent months. I'm sure there's more I could check, both in terms of my own numbers and existing literature, but this was really a little distraction for a day off. This doesn't quite do the paper justice, as it runs through a number of examples of how variations in retirement age, 401(k) matches, investment returns and health care coverage lead to different rates of saving and different target replacement rates at retirement. New paper: Can 401(k) Plans Provide Adequate Retirement Resources? Despite only having been in existence for 27 years - less than a typical working career - some analysts seem to have concluded that 401(k) plans are a failure. For example, Munnell and Sundn (2004, 2006) argue that the 401(k) is "coming up short" due to, among other factors, low contribution rates among those participating. A recent government report concludes that "low defined contribution plan savings may pose challenges to retirement security" (GAO, 2007). In addition, Ghilarducci (2006, 2008) has proposed to replace 401(k) plans with Guaranteed Retirement Accounts, in part due to belief that 401(k) plan participants will not be adequately prepared for retirement. This paper illustrates that moderate 401(k) contribution rates can lead to adequate income replacement rates in retirement for many workers; that adequate asset accumulation can be achieved using only a 401(k) plan; and that these results do not rely on earning an investment premium on risky assets. Using Monte Carlo simulation techniques, this study also illustrates the investment risk faced by participants who choose to invest their 401(k) contributions in risky assets, or who choose to make systematic withdrawals from an investment account in retirement rather than annuitize their account balance. Brady's paper is very interesting and worth checking out. For what it's worth, I should have an AEI Retirement Policy Outlook coming out next month which examines some similar issues. The table below shows combined Social Security and private pension replacement rates for the 1960 birth cohort as of age 70 (meaning, in the yea 2030). Replacement rates are adjusted for efficiencies of scale in household size, meaning that both pre- and post-retirement income is assumed to go further for couples living together with kids than for singles. (This adjustment process is one of the central points of the upcoming paper, and was inspired by recent work by Scholz and Seshadri and by Skinner). The simulations were conducted using the Policy Simulation Group models; they assume payment of current law Social Security benefits, and the assumptions regarding pension benefits are similar to those used in a recent GAO report. While there's much more to be said than can be outlined here, the main point is that – even assuming declining replacement rates from Social Security and the imperfections of the 401(k) system – projected replacement rates for most future retirees aren't bad, particularly since this analysis excludes other sources of retirement income (e.g., earnings, non-pension savings, implicit rent from housing). For reference, most financial advisors recommend a retirement income equal to around three-quarters of income during pre-retirement years. Social Security the Biggest Ponzi Scheme? Maybe, but that's not the whole story. Cramer is correct that, like a Ponzi scheme, payments to earlier participants in Social Security are financed by payments from later participants. Moreover, also like a Ponzi scheme, in Social Security or any pay-as-you-go program the highest returns flow to the earliest participants. What makes a Social Security program sustainable is its ability to alter the returns paid to succeeding generations of participants. The earliest participants in Social Security received average annual returns of over 20 percent. Were these returns promised to later participants then, like a Ponzi scheme, the program would collapse. However, returns for following generations have been far more modest, if not modest enough to make the program affordable at current tax rates. All that said, it's important to make policy distinctions between a Ponzi scheme, for which the sponsor rightly goes to jail, and a paygo program like Social Security, which has both advantages and disadvantages based on its choice of financing. It's often said (even by me) that a paygo program pays lower returns than a fully funded program that invests in real assets, but that's not really true. A mature paygo program pays a lower rate of return at any given time, but it also paid returns to a generation of retireees who would have received no benefits at all under a fully funded system (that is, individuals who were retired at the time the funded system began). Moreover, this initial generation of beneficiaries received very high returns under the paygo program. Once this difference in the number of generations receiving benefits is accounted for, the rate of return difference between a paygo program and a funded program narrows considerably. Moreover, a paygo program can potentially spread risk between generations in ways that a funded program can't. In theory, a paygo program can enable redistribution between richer and poorer cohorts, as I discussed here. Unfortunately, the current Social Security program isn't well set up to accomplish this risk-sharing between generations. But with reforms, this Ponzi aspect of Social Security could end up being beneficial. Read more! On Monday I began outlining several issues I have with Teresa Ghilarducci's proposals for Guaranteed Retirement Accounts (GRAs). The issues discussed here is diversification, both financial and political. Financially, the GRA proposal would place most worker's entire retirement savings in low-risk, low-return assets. Politically, the GRA proposal would have most retirees derive their entire income from the government. In neither case do I think it's wise to put all your eggs in one basket. Financial diversification: For the typical worker, money invested in Social Security's retirement program is akin to the purchase of bonds paying an interest rate equal to the rate of total wage growth in the economy. Since Social Security is a pay-as-you-go program that transfers money from workers to retirees, the implicit rate of return on the program is equal to the rate of growth of money that can be transferred: roughly speaking, this is the rate of labor force growth plus the rate of wage growth per worker. Going forward, these produce an implicit Social Security return of around 1.5% above inflation. While each person will earn a slightly different return, based on how their life circumstances interact with the complex Social Security benefit formula, for the average person the 10% or so of wages they pay to the Social Security retirement program will earn this 1.5% return. To this, the GRA plan would effectively require that workers contribute an additional 5% of wages to individual accounts managed by the Social Security Administration. While I have no particular problem with this, what does worry me is account holders would have no choice regarding what their contributions would be invested in. Every worker's account would consist of special government bonds paying a fixed return of 3% above inflation. The key insight of portfolio theory is that by combining different assets we can produce higher returns at lower risk. The reason isn't simply that assets have different levels of risk, it's that they don't always go up and down together. Mixing together assets that don't have perfect covariances can reduce the risk of the overall portfolio. So even people who want a low-risk, low-return portfolio might have stocks in it, while even those seeking higher returns might have some bonds in their portfolio. The chart below uses historical data on the standard deviations of annual returns for stocks, corporate bonds, trust fund bonds (which serve as a stand-in for the 3% return paid to the GRA accounts) and a "pay-as-you-go bond" that pays the same average return as Social Security. In addition, the chart utilizes the covariances between each asset: how closely the asset returns tend to follow each other. From this data, I calculated the lowest-risk portfolio for each expected rate of return. 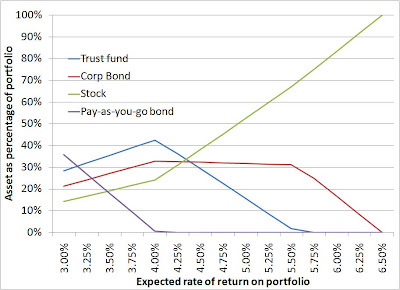 The rate of return any individual seeks is a function of their own taste for risk, but this chart can tell you that if you seek an x% rate of return that there's a mix of assets that minimizes your risk in doing so. What does this chart tell us? First, that even very risk-averse people – those seeking a return of only 3% above inflation, which is roughly what government bonds are projected to pay – would not invest solely in Social Security and a GRA account. Even these very low-risk investors would hold about 14% of their portfolio in stocks and around 21% in corporate bonds. As individuals' taste for risk increased, the percentage of their portfolios held in Social Security bonds and the 3% GRA-bond would change. Individuals seeking a 4% return would hold 42% of their portfolio in GRA bonds, but nothing in Social Security. Individuals seeking a 5% annual return would invest only 16% of their assets in GRA bonds and nothing in Social Security, but 32% in corporate bonds and 53% in stocks. The point here is that, since few people save more than 15% of their income for retirement, the GRA proposal forces individuals to invest most or all of their retirement savings in a portfolio that may be lower-risk than they desire and doesn't maximize returns given the level of risk the portfolio does have. Political diversification: As noted above, not many Americans save more than 15% of the income for retirement, for the good reason that 15% is a pretty adequate saving rate. As a result, were the GRA plan put in place, such that Americans saved roughly 10% of their wages through the Social Security retirement program and another 5% through GRAs, most people would choose to save nothing outside of these programs. In other words, their entire retirement income would derive from one source: the government. You don't need to be a wild-eyed libertarian to think that complete dependence on government for retirement income is unwise. As noted yesterday in the Financial Report of the United States, the government faces very large long-term obligations for which it has not well prepared. For that reason, Social Security benefits are an at least somewhat risky proposition going forward. Adding increased retirement benefit obligations through GRA accounts, which may or may not be fully pre-funded, seems like asking for trouble. Alternately, most people can help diversify against the solvency risk of Social Security benefits by investing in market assets whose returns aren't directly affected by the federal budget. In other words, as Social Security faces financial trouble, the rational solution for most individuals would be to save more outside of Social Security, not to start a new retirement program dependent on the same funding source. Some people like the idea of everyone getting their retirement income from the government, but I suspect that's more of a philosophical preference than a well thought-out policy conclusion. The Treasury Department has released the 2008 Financial Report of the United States, which includes extensive discussion of Social Security and other long-term obligations. Get your copy here. As noted here, Teresa Ghilarducci's Guaranteed Retirement Account plan would guarantee contributors a return of 3 percent above inflation. This sounds attractive, but is in fact a potentially very expensive proposition. Here's why. The Social Security Trustees project that the real return on non-inflation protected government bonds will be 2.9%; inflation-indexed bonds generally return around 0.5% less than nominal bonds since they're safer. So the GRA plan is promising returns higher than could be gained on similar market-based investments, which implies a subsidy. Moreover, returns on GRA accounts would be paid out from a fund invested in risky assets that would be managed by Social Security. Supposedly riskless returns backed by risky assets is a recipe for trouble – think about Fannie/Freddie, DB pensions and the Pension Benefit Guarantee Corporations, etc. I wrote about the costs of guaranteeing Social Security personal accounts here, and the underlying logic is the same here. In other words, there's an implicit subsidy of around 27% on each GRA contribution. Given that total annual contributions could top $350 billion, a 27% implicit subsidy is a pretty big deal if it's not budgeted for. Probably the biggest lesson we should draw from the current financial crisis is to be very careful about guaranteeing market investments against market risk. Structure. Guaranteed Retirement Accounts are like universal 401(k) plans except that the government, as befits a large and enduring institution, will invest and manage the pooled savings. Participation. Participation in the program is mandatory except for workers participating in equivalent or better employer defined-benefit plans where contributions are at least 5% of earnings and benefits take the form of life annuities. Contributions. Contributions equal to 5% of earnings are deducted along with payroll taxes and credited to individual accounts administered by the Social Security Administration. The cost of contributions is split equally between employer and employee. Mandatory contributions are deducted only on earnings up to the Social Security earnings cap, and workers and employers have the option of making additional contributions with post-tax dollars. The contributions of husbands and wives are combined and divided equally between their individual accounts. Refundable tax credit. Employee contributions are offset through a $600 refundable tax credit, which takes the place of tax breaks for 401(k)s and similar individual accounts and is indexed to wage inflation. Eligibility for the tax credit is extended to part-time workers, caregivers of children under age six, and those collecting unemployment benefits. If an individual's annual contributions amount to less than $600, some or all of the tax credit is deposited directly into the account in order to ensure a minimum annual deposit of $600 for all participants. Fund management. The accounts are administered by the Social Security Administration and funds are managed by the Thrift Savings Plan or similar body. Though funds are pooled, workers are able to track the dollar value of their accumulations, as with 401(k)s and other individual accounts. Investment earnings. The pooled funds are conservatively invested in financial markets. However, participants earn a fixed 3% rate of return adjusted for inflation, guaranteed by the federal government. If the trustees determine that actual investment returns have been consistently higher than 3% over a number of years, the surplus will be distributed to participants, though a balancing fund will be maintained to ride out periods of low returns. Retirement age. Participants begin collecting retirement benefits at the same time as Social Security, and therefore no earlier than the Social Security Early Retirement Age. Funds cannot be accessed before retirement for any reason other than death or disability. Retirement benefits. Account balances are converted to inflation-indexed annuities upon retirement to ensure that workers do not outlive their savings. However, individuals can opt to take a partial lump sum equal to 10% of their account balance or $10,000 (whichever is higher), or to opt for survivor benefits in exchange for a lower monthly check. A full-time worker who works 40 years and retires at age 65 can expect a benefit equal to roughly 25% of pre-retirement income, adjusted for inflation, assuming a 3% real rate of return. Since Social Security provides the average such worker with an inflation-adjusted benefit equal to roughly 45% of pre-retirement income, the total replacement rate for this prototypical worker will be approximately 70%. Death benefits. Participants who die before retiring can bequeath half their account balances to heirs; those who die after retiring can bequeath half their final account balance minus benefits received. In following posts, I'll look at several aspects of the GRA plan that I think are worth considering more carefully before moving ahead. Want to go on disability? Work for the railroad. Since its inception, the board has been so riven with conflicts that it took a half century to update what were supposed to be temporary disability standards, leaving in place until 1998 archaic diagnostic terms like "cretinism," "imbecility" and "middle-class moronism." It's not uncommon for public sector workers to effectively retire on disability, as it generally provides higher payments and often a tax exemption. This story in the Washington Post documents similar abuses in the Montgomery County, Maryland police department. The New York Times Freakonomics blog has a Q&A feature with Ross Perot where the billionaire budget reform answers reader questions on a number of topics, including Social Security reform. Q. How do you believe Social Security can be reformed (or abolished, if you believe this) to benefit my generation (I'm 17 years old) as well as the current generation? A. Plans such as Rep. Paul Ryan's (R.-Wis.) "Roadmap for America's Future" contain several ideas for reforming Social Security that deserve serious consideration. The challenge is to preserve the benefits for retired citizens and those nearing retirement age, say 55 and older, while strengthening the retirement benefits for the remaining workers. This would include ensuring the solvency of the Social Security system with changes to the retirement age. Contrary to conventional wisdom, the current financial crisis offers the perfect time to face this problem. The record deficit spending that has already been approved is sure to place enormous burdens on our children and grandchildren for years to come. Taking steps now to solve the Social Security dilemma (as well as the more pressing problems posed by Medicare and Medicaid) will help to bring clarity to the long-term outlook for our nation's financial future. Should we lower the payroll tax to stimulate the economy? I’m not so sure. A number of economists are arguing that the best way to stimulate the economy would be to lower the payroll tax, which funds Social Security and Medicare. (E.g., see here and here.) Republican political bloggers like Ross Douthat and David Frum are also on board, arguing that payroll tax cuts have more salience for the middle class than income tax cuts, since most workers pay more in payroll taxes than income taxes. To decide, we should consider how great the short-term stimulus would be versus the potential long-term costs to how we view and run Social Security. How much would a payroll tax cut stimulate the economy? In theory, not very much. Friedman's permanent income hypothesis argues that consumption will rise in proportion to changes in people's permanent – meaning long-term – income. So if we made a permanent reduction in the payroll tax then we could expect that consumption would increase by a commensurate amount. But the consumption increase from a temporary payroll would be spread out over many years to come, meaning that the immediate effects would be minor. This is probably even truer due to our current conditions, where people are worried about their jobs, their mortgages, their credit card statements, etc. Give that kind of person some extra cash today and what do you think he'll do with it? Probably save it by paying down some of his debt or putting it in the bank. (This news story cites both opinion polls and some economic research pertaining to the 2001 income tax rebates.) Certainly some people will spend it all, but a lot won't. So I'm lukewarm on the stimulus end. In any case, it's important to weigh these positive short-term effects against the negative longer-term effects. Payroll taxes, particularly Social Security taxes, are dedicated to a specific program. Social Security taxes are often termed "contributions" because in many ways they function more like a contribution to a retirement account than like income taxes paid to the government. The reason is that Social Security benefits are pegged to Social Security taxes: you don't qualify for benefits unless you've paid into the system, and the more you pay the higher the benefits you receive. "politics all the way through. We put those pay roll contributions there so as to give the contributors a legal, moral, and political right to collect their pensions and their unemployment benefits. With those taxes in there, no damn politician can ever scrap my social security program. Those taxes aren't a matter of economics, they're straight politics." Roosevelt also specifically mentioned the psychological effect of contributions in destroying the "relief attitude," which is what we today would call the stigma of welfare. Cutting the payroll tax could lead Social Security to be seen more as a welfare program than a contribution, which will tend to reduce public support for the program. When people are receiving benefits that they didn't pay for, it's not unfair to term that welfare. Moreover, cutting payroll taxes repeats a mistake the GOP made on income taxes. Many Republicans are so focused on cutting marginal rates for high earners that in exchange they were willing to take more and more low earners off the tax rolls entirely. As a result, around 40 percent of Americans currently pay no income taxes. Under Sen. Obama's plan, I believe that share would rise to around 50 percent. These folks have much less incentive to monitor the level or quality of government spending, since they have very little stake in financing government. By cutting the payroll tax, we'd be taking more Americans off the federal tax rolls entirely. I don't see that as a particularly helpful trend in general, and less so with regard to Republican partisan interests. After all, President-elect Obama already has a plan to cut the payroll tax, which would cost $779 billion over 10 years. Do Republicans think they can compete with Obama's plan? Should they even try? Ironically, I generally agree with both Douthat and Frum on the need to modernize the Republican Party and accept many of their proposals to do so. I just don't think cutting payroll taxes moves things in the right direction. The Center for Retirement Research at Boston College has released a bunch of new papers. Michael Messner’s feeling guilty. And I have a solution. Michael Messner, a professor of sociology and gender studies at USC, writes in the LA Times that he is feeling a bit guilty because his Social Security taxes have been reduced. Folks who earn over the taxable maximum of $100,000 have a few weeks or months at the end of the year in which Social Security payroll taxes are not deducted from their paychecks. Is Messner happy? No way. I don't want it. My message to President-elect Barack Obama and to the Democratic-controlled Congress is this: Tax me more. Don't worry, Prof. Messner. I suspect it won't be too long until President Obama and the new Congress oblige you. Sec. 132. (g) [42 U.S.C. 401 note] For the purpose of Federal income, estate, and gift taxes, any gift or bequest to the Federal Old-Age and Survivors Insurance Trust Fund, the Federal Disability Insurance Trust Fund, the Federal Hospital Insurance Trust Fund, or the Federal Supplementary Medical Insurance Trust Fund, or to the Department of Health, Education, and Welfare, or any part or officer thereof, for the benefit of any of such Funds or any activity financed through any of such Funds, which is accepted by the Managing Trustee of such Trust Funds under the authority of section 201(i) of the Social Security Act, shall be considered as a gift or bequest to or for the use of the United States and as made for exclusively public purposes. So feel free to donate that extra cash to Social Security. They'll gladly take it and your guilt will be assuaged. As for the rest of us, though, bear in mind that Social Security taxes were capped for a reason. FDR was very concerned that Social Security benefits be seen as an earned right, as distinct from what was then called "relief" or today is called "welfare." Social Security has always been progressive, but that progressivity has been tempered with a focus on equity, the idea that people receive benefits in reasonable proportion to the taxes they pay. Equity is hard to define, but it's worth pointing out that the system's progressivity hasn't changed a lot since it began. (Happy to provide some examples if anyone is interested.) President-elect Obama's plan to levy new taxes for folks earning over $250,000 is truly out of character with Social Security's history. Now, there may be good reasons to change how Social Security is structured. But we shouldn't miss the fact that it would be a big change. My smart and dedicated research assistant Adam Paul has a very nice article at Tech Central Station with the latest on what's been happening in Argentina with regard to the reform/nationalization of their private social security savings accounts. Given the parallels to what some folks are proposing for the U.S., it's worth checking out. Does Social Security actually spread risk across generations? Two of the better arguments for the Social Security program are the ability of a government-run program to spread risk both within and between generations. Spreading risk within a generation means redistributing from higher to lower-earning members of the same birth cohort. Spreading risk across generations means redistributing from relatively high earning birth cohorts to relatively low-earning ones. Both of these risk sharing functions are potentially very valuable, yet neither is easily accomplished through private markets. This creates a potentially strong argument for a pay-as-you-go program like Social Security: it can do things that a simple forced savings plan couldn't do. I've recently been doing some work on the ability of Social Security to spread risk within generations. (I'll have an AEI paper out on that shortly, or you can click here for a preview of some of the basic thoughts.) Intra-cohort risk – the risk of having low earnings relative to other members of your cohort – is addressed through a progressive benefit schedule. Individuals with low lifetime earnings receive higher benefits relative to their earnings – a higher "replacement rate" – than do higher earners. However, as this chart shows, there's actually a lot of variation in replacement rates even for people with the same earnings, due to quirks in the benefit formula. As a result, Social Security's "insurance" against relatively low earnings doesn't work nearly as well as it could. But here I'm interested in looking at Social Security's ability to spread risk across generations. Social Security is often called a "compact between generations." As a pay-as-you-go program, in which each working generation funds the retirement benefits of the generation that preceded it, Social Security could in theory smooth transfer resources between richer and poorer generations. A relatively poor generation, for instance, would be subsidized by a relatively rich generation that followed. The risk that you'll belong to a relatively poor generation – one that lives through times in which average earnings and economic growth are low – can't be diversified away through any ordinary means of investment or insurance. So Social Security can accomplish intergenerational risk sharing in theory. But does it do so in practice? I don't think so. Here's why. Under Social Security, average retirement benefits for a given cohort are calculated based on average wage growth during that cohort's working years. Here's how it works: when you retire, your past earnings are "wage indexed" to the year you turned 60. For instance, if you earned $10,000 at age 25 and average wages economy-wide grew by 3 percent annually from that year through age 60, then that $10,000 wage would be "indexed" to $28,139. This process is followed for all your past wages, which are then averaged. For the typical worker, Social Security pays a benefit equal to around 40 percent of the average indexed wages. The key here is that your retirement benefit depends both on your own wages and on the growth of average wages in the economy. The faster average wages grew during your working years, the higher your own benefit will be in retirement. The rate of average wage growth is like an interest rate that's paid on your past earnings and Social Security contributions. But here's the problem: the earnings of future workers have no effect on the benefits owed to contemporaneous retirees. Wage growth for Generation B play no role in the benefit calculation for Generation A. For instance, imagine that average wages grew only 1 percent annually during your working years, but that in the year you claimed benefits wage growth took off and continued at a 5 percent rate throughout your retirement. Unfortunately, you would not share in any of that wage growth. So it seems that in ordinary circumstances Social Security doesn't do much to spread aggregate earnings risk between generations. It may be financed cross-generationally, but the benefits a given generation is entitled to aren't dependent on the earnings of following generations. Would it be possible for Social Security to spread risk more effectively between generations? Yes. Consider a reform plan where retirees receive a benefit equal to a given percentage of the average wage at the time. For instance, retirees in 2008 might receive a benefit equal to 25 percent of the average wage earned by workers in 2008. This would produce an annual benefit about equal to the benefits received under current law. However, the benefits received by retirees in 2008 would depend on average earnings in 2008, not on the retirees average earnings during their working years. If earnings rise more rapidly, that extra wage growth will be shared with current retirees. But if earnings grow only slowly, retirees will also share some of that pain. The advantage here is diversification: most retirees will have some non-Social Security savings, the level of which depends on how much they earned while working and on the interest rates their investments received. Deriving part of their retirement income from a different source, the earnings of future workers, allows them to diversify against the risk of their birth cohort having low earnings growth or receiving poor returns on their investments. But again, it appears that current law Social Security doesn't really take advantage of this opportunity to smooth risk across generations. Should Americans bail out the government? Pelosi and Reid declared that the American people "deserve to see a plan that is accountable to taxpayers and that is viable for the long-term," with "significant sacrifices and major changes to [the automakers'] way of doing business." These sound conditions should be applied to the federal budget as well. Unfortunately, though, there is no special guardian of future generations to make such demands. That job belongs to our elected leaders. They, too, must demonstrate significant sacrifices and major changes to their way of doing business. After all, they share responsibility for the nation's future just as the Big Three executives share responsibility for the future of the auto industry. The automakers are, at last count, asking for $34 billion in government aid, in exchange for which Congress is demanding concrete "proposals to address the payment of health care and pension obligations." But according to the 2008 Social Security and Medicare Trustees Reports, the government's long-term pension and health care shortfalls total $13.6 trillion for Social Security, $34.4 trillion for the trust fund portion of Medicare, and probably a similar amount for the general revenue funded portions. In other words, the federal government has similar problems to the Big Three, only several thousand times larger. Should Americans demand that Congress put together a plan? This Bloomberg story isn't directly Social Security-related, but it reminds me of a few interesting issues from the Social Security debate from a few years back. Bloomberg reports that health and auto insurance purchased through AARP often costs far more than seniors could buy simply by calling up an insurance company on their own. Understandably, some AARP members were upset, thinking they would receive discounts by purchasing through the organization. They story didn't have extensive responses from AARP and they may well have good explanations for how they price their insurance products, so I don't want to hit that issue too hard. This got me thinking: how much did AARP charge for their mutual funds, which they offered through a co-branding with Kemper Securities? Given their rhetoric regarding fees that would be charged for Social Security accounts, as well as their general mission of providing low-cost products and services to seniors, one would assume the admin charges on AARP branded mutual funds would be at least as low as those charged to someone who walked into an investment company off the street. As it turned out, that wasn't really the case. For instance, consider funds that track the S&P 500 index. AARP's annual charge for their index fund in 2005 was 0.45 percent of account balances, or "45 basis points" in investors' jargon. This was almost twice the industry average of 25 basis points for products that are, by design, identical. Of the 10 largest S&P 500 index funds, 8 had lower expenses than AARP's. Since I invest through Vanguard, I compared fees on a range of AARP funds to comparable funds offered through Vanguard. The table below shows what I came up with (remember, these were fees as of around April 2005). Averaging nine typical funds, AARP's fees to its members were 2.6 times higher than Vanguard's. I believe the minimum investment requirements were lower for AARP than for Vanguard, which could make the AARP funds a better deal for very small investors. But for a typical person, AARP's fees were definitdely higher than Vanguard's. Over long periods, this can make a big difference in what you end up with. Annual fees on sample of 9 similar mutual funds (as percentage of fund assets) as of April 2005. I believe AARP has changed its co-branding from Kemper to another company and its current fees appear more reasonable. The net admin cost for each of the three stock funds is 50 basis points. Each fund is composed of index funds of domestic and international stocks and corporate bonds. AARP's aggressive mutual fund is similar to Vanguard's LifeStrategy Moderate Growth, which carries an annual administrative cost of 23 basis points. However, the $3,000 minimum investment for Vanguard is higher than for AARP's fund, where the minimum is only $100. That said, if you have more than $3,000 – and I'd guess that most AARP members would – then it's not clear that AARP's funds offer better value than you'd get from Vanguard or some alternate provider. The lesson: shop around. One final note: you could argue that while you'd pay more for an AARP mutual fund than from some other companies, AARP takes that extra money and puts it to good use through its policy advocacy and services to seniors. However, you'd still come out ahead if you bought the cheapest mutual fund available then donated the savings to the AARP Foundation, for which you would receive a charitable tax deduction. Social Security and Medicare can be reformed so that each worker saves and invests funds for his own post-retirement pension and health care benefits. The burden for the current generation of workers would be substantial: saving for their own benefits while at the same time paying taxes to fund the benefits of current retirees. However, over time Social Security and Medicare would be transformed from pay-as-you-go programs in which each generation is dependent on the next generation of workers/taxpayers into funded programs in which each generation pays its own way. Political blogger Ed Morrissey pushes back on the assumption that recent market declines are an indictment against President Bush's plans for Social Security personal accounts. He makes many of the same points I made in this paper, plus discusses a bit about the CBO/Trustees projections for Social Security finances. Given both poor wage growth and low interest rates, it's likely that Social Security's finances will take a bit of a hit in the next Trustees Report, due in March. However – much like the point I made about personal accounts and stocks, where it's the long term that matters – I suspect any negative impact on Social Security solvency due to the financial crisis and recession will be modest. Whether you agree with this as an accurate description of the current program, or whether this is how the system should continue to work in the future, the SSA page is a very good summary of the traditional view of how Social Security should and does work. Read on. Underlying the Social Security program are certain basic principles that guide its development and growth. These characteristics are worth noting because they are the key to how the program accomplishes its goal to provide a base of economic security for the American people. Five of these principles are discussed below. The Social Security program is not and was never intended to be a program to provide benefits based on need. Rather, it is a system of social insurance under which workers (and their employers) contribute a part of their earnings in order to provide protection for themselves and their families if certain events occur. Since each worker pays Social Security taxes, each worker earns the right to receive Social Security benefits without regard to need. This is one of the basic principles of the Social Security program and is largely responsible for its widespread public acceptance and support. The fact that Social Security benefits go to some people who have high incomes has been a source of criticism. However, these persons pay into the program and play an important role in its financial base. Moreover, benefits of higher earners are subject to the income tax as a result of the 1983 Social Security amendments. 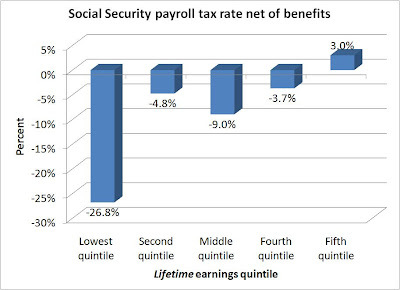 Social Security taxes and benefit amounts are related to a person's level of earnings during working years. As people earn more money and pay more in Social Security taxes, they are earning a right to higher benefits. There is, however, a limit on the amount of yearly earnings on which Social Security taxes must be paid and on which program benefit payments are figured. Some have argued that this limit favors high earners, who do not have to pay on as high a proportion of their earnings. However, the limit, which automatically increases as wages increase, is necessary. If all the earnings of higher paid workers were taxed and then credited for benefits, the program would have to pay very high benefits. Another argument against work-related benefits has been that people who do not work for one reason or another (homemakers, disabled children) may not earn the right to benefits. However, in general, such persons are covered as dependents of workers and may receive retirement, survivors, or disability benefits on the workers' earnings records. The main source of Social Security income is the taxes that employees, employers, and the self-employed pay. This method of financing Social Security—a payroll tax on workers and their employers—remains the primary method of financing the program. The Social Security program has won widespread public acceptance and support largely because it is directly supported by the people who receive benefits from it. Both benefit amounts and Social Security taxes are based on the worker's earnings under the program. This aspect of Social Security helps to avoid any implication that the benefits are a form of government assistance or public charity. A continuing argument against the payroll tax is that it places a burden on the cost of doing business. It decreases the number of workers a company can afford to hire (and pay matching Social Security taxes) and limits the amount of wages they can afford to pay, the argument goes. However, companies are permitted to deduct the Social Security taxes they pay from their income tax as a business expense. They are also permitted to include Social Security benefits workers expect to receive in the company's pension plans. Since the Social Security program began, many ideas have been advanced for obtaining additional revenues. However, the Congress and various advisory groups that have studied the program over the years have not endorsed proposals which would alter its basic structure. The method of figuring benefits is weighted in favor of workers with low average lifetime earnings and those with families. This is because the program attempts to achieve social adequacy as well as individual equity. The goal of social adequacy assures that individuals receive a level of benefits that reflects their lesser ability to prepare for the risk. The goal of individual equity means that a person receives a reasonable return on his/her investment in Social Security. In addition, the eligible members of the family of a retired, disabled, or deceased worker are paid benefits up to a family maximum. As a result, Social Security has made a substantial contribution to raising people's income above the poverty level. It is estimated that if there were no Social Security, there would be almost four aged poor persons for everyone that is now classified as poor. Thus, any additional cost to the program as a result of the weighting of benefits is more than offset by the social gains that result. How are we going to pay for it all?